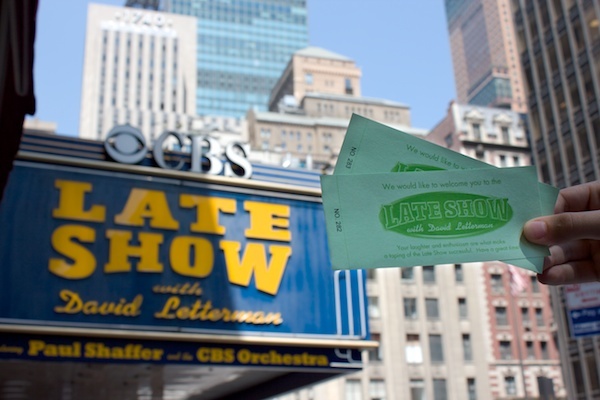 When we initially planned our return to NYC, we sent in a request for tickets to see a taping of the Late Show with David Letterman. We heard nothing from the show until a few days before the taping. We followed their strict instructions, and made our way to the historic Ed Sullivan Theater by mid-afternoon on the day of the show. Arriving early, we decided to do the requisite complement to a Late Show taping: a visit to Rupert! 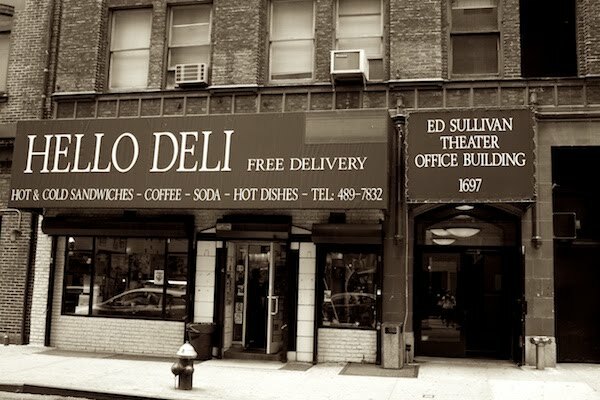 For those not familiar with American late night television, Rupert is the proprietor of the Hello Deli (located adjacent to the Ed Sullivan Theater). 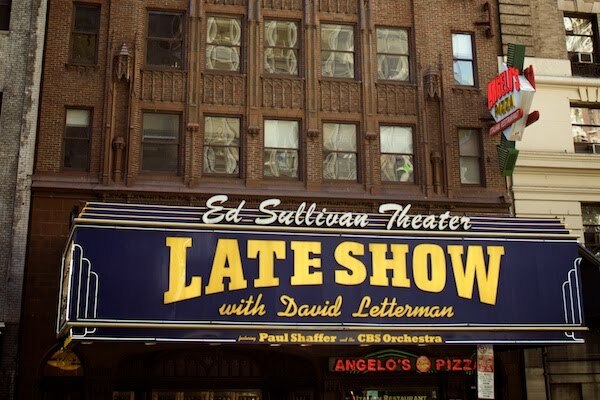 During the first year of his show (1993), host David Letterman interviewed characters from the neighborhood surrounding his theater as a sketch. Rupert's sheer lack of charisma and affability quickly made him a favourite of both the viewers and Letterman. 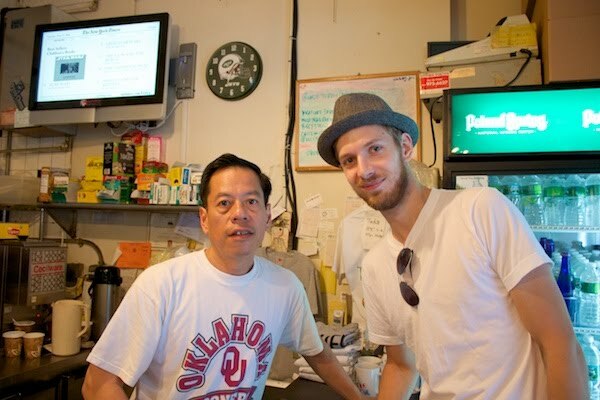 He still spends his days selling reasonably priced sandwiches, and now poses for pictures with tourists. Partially because we were hungry, and partially out of amusement, we bought a Regis Philbin sandwich (roast chicken, muenster cheese, lettuce, tomato and ranch dressing on a baguette) and I posed for a photo with Rupert. After eating, we lined up to be given our tickets and a pre-show briefing (no hats, no photography, etc…), and warned about the near freezing temperature of the studio (allegedly Dave's idea to improve sound and keep the audience from dozing off), before being told to return in an hour for seating. The experience was similar to seeing Late Night with Jimmy Fallon, except everyone at Letterman seemed to hate their jobs and our hands hurt from clapping for fear that we'd be thrown out if we didn't. While not being as interesting as The Roots, Paul Shaffer and the CBS Orchestra are incredibly well rehearsed and talented, and Mina was trilled to see the Black Keys live because she's a fan of the band. Leaving the theater, we headed to the side street with hopes of taking some paparazzi style photos of the guests leaving. Unfortunately, we were beat by the pros, who were busy taking pictures of the Salahis (who made an uninteresting cameo during Dave's monologue). If you don't know who they are, consider yourself a better person for it. I'm not even gonna lie. I'm totally jealous you saw SJP. yay for SJP, and seeing Rupert! sorry about having to see the Salahi disaster. I went to a taping of Ellen's show in LA and it was so fun; we HAD to dance if we were in the front (I was in the very front). hahaha i love how honest you are about the things you guys do everywhere. when i went to letterman to do an actress hair the paprazzi outside was so weird. after i left there was a woman sitting on a rolling office chair trying to get me to get the actress to come outside and talk to her. she was such a weirdo, it was pretty funny though. seriously? asked to leave if you're not enthusiastic enough? - yikes! glad you guys got some enjoyment out of it! Ha, I loved that you saw Letterman live! I've always wanted to do that, just to see what it's like. Amazing! Thanks for the candid sharing, feels like one was there. When I used to live in NYC, I worked at Entertainment Weekly in the building next to Letterman. We would buy our lunch from Rupert daily, and as I never stay up late enough to watch the late night talk shows, I had no clue who he was for the longest time! how fun!!! and let me just say, i might have to reference your picture of rupert since he is wearing an OU shirt...my alma mater. :) the regis sandwich actually sounds pretty delicious!